Love the mini - thank you so much for sharing it - great use of the colour swatch!! Thank you for your portion of the train. Delightful. And I can see a few (or more) of you kits, that I will have to put on must have list. Th♥nk you for sharing with us! 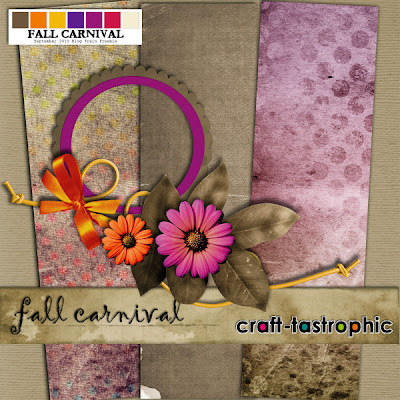 Toot toot, thanks for your lovely Fall Carnival kit. I am thoroughly enjoying my ride on the blog train. God bless. Thank you so much for sharing your wonderful talent with me. Love your purples. Thank you for the fantastic kits. I've just bought one of them on your site. I wanted to use the coupen, but I could not do it? Do you have idea why not? Petruskina, I sent you a new coupon to your email. So sorry!!! The coupon included in zip is working and valid trough Sep 30th!!! Your part of the blog train is so elegant, I'm totally in love with it! Thank you so much. I wish I could apply for the CT call, unfortunately time isn't enough for everything!